Syrian negotiations in Astana. It's the first time the rebels' representative and government delegation sit face to face in an international arena with the hope of hammering out the first step of a solution to the country's long-lasting conflict. A meeting of the Syrian government and the armed opposition resulted in a consolidation of ceasefire terms thanks to the mediation of Russia, Iran and Turkey. Feelings ran high at the tense talks, and while Damascus and its adversaries found themselves at the negotiating table for the first time, no direct talks actually took place. Both sides communicated through officials of the mediator countries. Neither the Syrian government nor the armed opposition signed the final statement on the results of two days of talks in Kazakhstan’s capital, Astana. The document was released at the behest of Russia, Turkey and Iran, which are the three mediator countries sponsoring the Astana talks. The troika stated the need to separate the armed opposition from bona fide terrorists, and to set up a three-party mechanism to monitor the ceasefire that came into force on Dec. 30. Bashar Jaafari, Syria's permanent United Nations representative and head of the government delegation, described opposition representatives as `terrorists’ and showed his contempt by walking out of the hotel where the talks were taking place. The opposition representatives expressed dismay at the final statement for not reflecting what they see as Iran's negative role in Syria. Russia's approach, however, has differed from that shown by Iran and the Syrian government. Russia is trying to adopt the position of mediator rather than unconditional supporter of Assad. "Previously, we joined Assad and Iran in labeling the entire opposition as terrorists, but now we are talking to them," said Vladimir Akhmedov, a senior research fellow at the Russian Academy of Sciences’ Institute of Oriental Studies. Even the opposition recognized Russia’s constructive role. "Russia is progressing from being a partial player with a direct role in military operations, to assuming the role of an arbiter with influence over Iran and Syria," said Mohammed Alloush, the leader of the opposition delegation, while speaking at a news conference after the talks. Alloush voiced the hope that Russia would continue to play a positive part in achieving a lasting settlement. After having unconditionally backed the opposition, Turkey is also switching to a more moderate stance, said Akhmedov. He recalled that Turkey had recently officially withdrawn its demands for Assad to step down as president of Syria. Akhmedov believes that Russia and Turkey are managing to influence Iran with its more radical position and this is why the troika is succeeding. 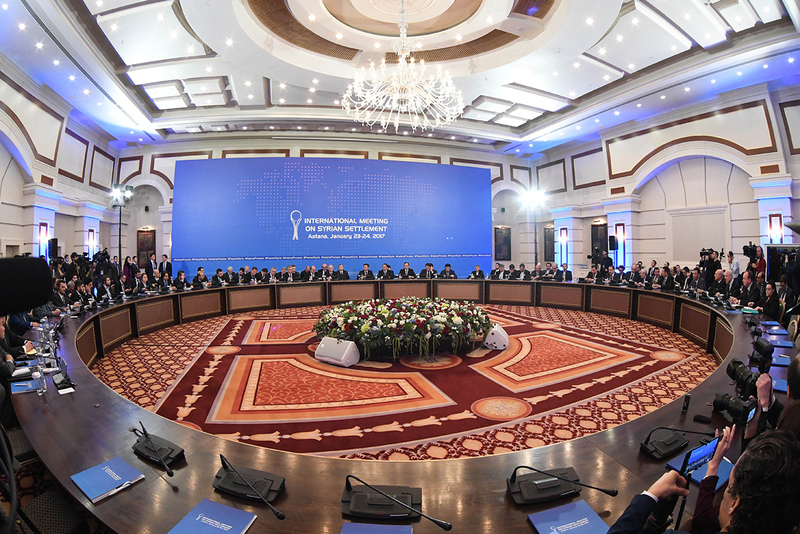 No new agreements or guarantees of a comprehensive peace plan were signed in Astana, but that was highly unlikely from the start, said Anton Mardasov, head of the department of Middle Eastern conflicts at the Institute of Innovative Development in Moscow. "The point of the meeting was to officially give record to the ceasefire which is currently in place," said Mardasov. The ceasefire between the government and that part of the opposition amenable to negotiations has made it possible to cease hostilities, leave certain territories under the control of the opposition, and to give the opposition a chance to fight Islamic State militants and Jabhat al-Nusra. Previously the process of separating the armed opposition groups from al-Nusra, which now calls itself Jabhat Fateh al-Sham, had caused major problems. "This time, unlike the previous ceasefires reached under the patronage of Russia and the U.S., separation is really happening with new detachments of the Free Syrian Army being formed to fight against Jabhat al-Nusra," said Mardasov. Unlike the U.S., Turkey has direct influence over the opposition, and is playing an important role in the ceasefire. Despite this small amount of progress achieved with the troika's help, the road to a final and lasting peace in Syria will be a long one. The opposition insists that Assad should step down, but he has no intention of relinquishing power, and he regards himself as the legitimately-elected president. The ceasefire is welcomed, but without a political settlement the situation could again slide into war between Assad and the opposition, said Leonid Isayev, a senior lecturer at the political science department of the National Research University Higher School of Economics. "The Syrian conflict has seen periods of truce thanks to negotiations in Geneva, but they remained in force only until the attempt to reach a settlement failed and then the war resumed again," said Isayev. The next stage of peace talks will take place in Geneva and is planned for Feb. 8. That meeting’s goal, according to an opposition representative, will be to "conclude and supplement" what has been achieved in Astana.